If we define income as the event that results in money flowing into the business, then how do you think we define expenses? Expenses are simply the events that result in money flowing out of the business. Repairs (for example, to machinery). Expenses are the opposite of income. More expenses means less profit, which means less for the owner. 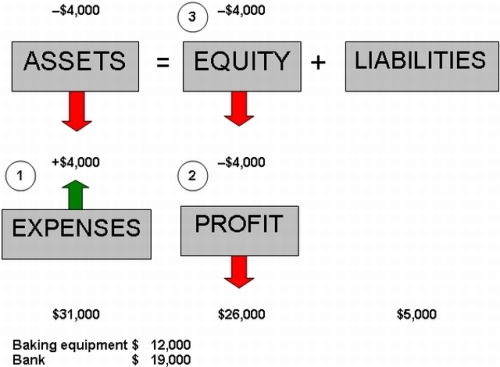 The owner’s equity and expenses are therefore conversely (oppositely) related, and thus expenses come into being (and increase) on the left side. The salary paid to the assistant is an expense, and this amounts to $4,000. Expenses take place (or increase) on the left, because it is the opposite of income and means less for the owner (owner’s equity). Consequently, this expense results in $4,000 less for the owner. As we pay the $4,000 cash, our assets also go down (on the left). The owner now has a stake of $26,000 of the total assets of $31,000. Once again, the external parties’ stake (liabilities) will be the same as it was before this transaction ($5,000). So as you can see, expenses result in the owner having a smaller share of the assets. 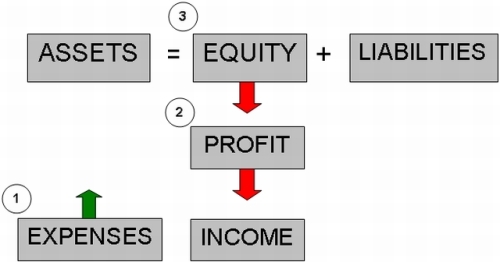 If you are at all uncertain about how owners equity works, return to this earlier lesson called What is Owners Equity? and get more certainty on this key accounting concept. If you're comfortable with the above, move along. Interests on Loans - Income or Expense?